Presidential Glen, the new Greater Austin planned neighborhood from LGI Homes, offers three, four and five bedroom homes in a well-designed landscape designed to foster a feeling of both privacy and community. Community: LGI Homes has thoughtfully located each home on a generously sized lot. Fully landscaped in front and privacy fenced in the back, these freestanding distinctive residences share a natural green preserve crisscrossed by walking paths leading to a covered picnic pavilion. Nearby, in a park-like setting complete with benches, neighbors can sit and chat while they watch their children slide or swing high up to a Texas—wide blue sky. Home Features: Each three, four or five bedroom home features an attached two-car garage and two baths. Free upgrades (valued at more than $10,000) include vaulted ceilings, brushed nickel fixtures and hardware, raised six panel doors, granite countertops and custom built cabinets. LGI Homes plans interiors to maximize room for you and your family and ease your daily chores with a utility room and high quality appliances. This spacious new home might be purchased for a little as $629/month. With low HOA fees, home ownership could be less than the cost of renting. Come Home. With a new construction warranty and no money down, you may soon be comfortably living at Presidential Glen not far from the lively city of Austin, Texas. 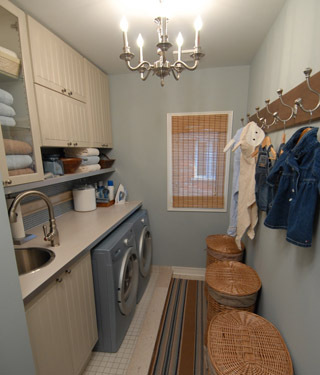 For many who make the move into one of our beautiful, brand-new homes, the dedicated laundry room can be a source of immeasurable happiness and pride. Gone are the days of washing laundry in the dusty garage or the dark basement—a set-up so typical in older homes. And gone are the days of schlepping armloads of dirty laundry, laundry soap, dryer sheets, fabric softener and rolls of quarters to the laundromat or apartment laundry room. Indeed, having a private, indoor laundry is one of the biggest attractions of owning a modern, functional home, such as those built by LGI Homes. Who wouldn’t want a quiet, brightly-lit room where your family’s laundry can be done in comfort and with convenience—and no one ever heaps your wet clothes on top of the dryer out of impatience? 1. Keep it simple. Clutter can turn even the largest laundry areas into a tangled nightmare of half-empty bottles, broken clothes pins, and lost socks. The less you store in your laundry area, the better, so trim down to the basics, and don’t use the laundry room as your home’s biggest junk drawer. 2. Stay organized. A small investment in organizational items like storage bins, baskets, and shelving can keep your laundry room tidy, attractive, and functional. Additional helpful items include hanging racks for drying and hanging ironed clothing, ironing stations with wall-mounted ironing boards, and a pin board for hanging stain removal and washing tips in plain sight. 3. Get personal. An easy way to streamline laundry day is to have baskets assigned for each member of the family. Cleaned clothing goes into a designated basket, which makes delivering clean laundry back to each family members’ room easier, and keeps finished laundry from hanging around the laundry room for too long! Look for baskets that are large enough to handle the amount of clean clothes you generate per person. Also, baskets that stack when not in use are ideal for saving space. 4. Go smaller. Many of us shop at large warehouse stores, and come home with army-sized containers of laundry detergent, fabric softener, etc. Instead of lugging out these larger containers every time you do laundry, consider opting for smaller, decorative containers that can be left within easy reach, while beautifying your laundry space at the same time. See-through glass containers are a great choice for powders and liquids, and can be purchased cheaply (in a wide variety of colors and shapes) at home decorating shops as well as thrift stores. Simply refill when needed, and laundry instantly becomes more elegant! 5. Avoid sock soup. Finally, a tip for everyone who has ever mourned the loss of a sock: when folding laundry, keep a bin nearby for the inevitable stray socks that remain at the bottom of the basket. Once every month or so, go through the sock bin and match up pairs—an easy task that even preschoolers in the family can do, and the thrill of reuniting these kindred souls can be very satisfying. You’ll save frustration, save time, and save your favorite pair of socks! One of the benefits of living a bit further out from the heart of the urban environment is the space that such communities grant for the simpler pleasures, such as a stroll down tree-lined walking paths, a dip in a backyard pool, or a day of gardening in your home’s front or back yard. At many of our LGI Homes communities, our brand-new homes are offered on oversized, landscaped lots that give homeowners even more space in which to relax, live, and play. Each of our homeowners answers the question, “What to do with all of this space?” in a different way, but for most the extra space represents the opportunity for fun, happiness and enjoyment. What to do with all of that space? Here are some tips on how to figure out your own answer to that question. Observe. There’s nothing like an excuse to take some time out in the early summer, sitting quietly in your yard and learning about your land. Grab a drink, settle into a comfortable chair, and learn about your yard. Where does the sun shine brightest? Are there shady areas? What areas of the yard get sun for the longest period throughout the day? Answering these questions will help lay the groundwork for how your large lot can best be utilized, and which areas may be devoted to different plants, activities or uses. Consider. With a large lot like those offered in select LGI Homes communities, you have a number of options when it comes to making the most of the land surrounding your home. How do you envision spending your time there? Big barbecues while you watch the game on an outdoor t.v.? Enjoying popsicles while the children play? Harvesting home-grown veggies and flowers? Playing fetch with the dog? Or perhaps a blend of all of these things? What you want to do in your backyard defines how it should be designed to answer to your needs, and will give you the best idea on where to start looking for ideas. Tailor. If you’ve gathered a number of ideas, now is the time to start tailoring those ideas to your distinct tastes, the needs of your family, and the dictates of your budget. You can hire a landscaper or landscape designer to synthesize these ideas together, or you can enjoy the process of planning on your own. Try to come up with an overall plan on how your lot will look after all of the work is complete. You can make a simple drawing, use a computer program, or create an “idea board” that details the elements you want to incorporate, from hardscape, to plants, to lighting. If you’re doing the work on your own, as many choose to do, realize that the lot will be a work-in-progress for a few years—the fun is in the journey! Get started. Once your plan is in place, you can start building (or planting) the yard of your dreams! It may start with planting some trees, or it may start with laying down a stone pathway. Whatever catches your fancy is a great place to start. Just enjoy the blessing of your own large lot of land, and see where the spirit takes you!